Messe Düsseldorf GmbH and its local partner Tezulaş Fuar continue their cooperation and are extending an invitation to the third TOS+H EXPO, Turkish Occupational Safety + Health Exhibition, in Istanbul from 6 to 9 May 2018. Held in parallel will be the IX International Occupational Health and Safety Conference organised by the Turkish Ministry of Labour and Social Security. From 6 to 9 May 2018 everything at Halic Congress Centre in Istanbul will revolve around personal protective equipment, health and safety at work. As the most important industry and communication platform for safe and healthy working in Turkey and its neighbouring countries, TOS+H EXPO attracts trade visitors to the metropolis on the Bosporus having already enjoyed two successful events. As in 2014 and 2016, the Turkish Occupational Safety + Health Exhibition will be accompanied by the concurrent IX International Occupational Health and Safety Conference. The latter will also be held at the Halic Congress Centre and organised and coordinated by the Turkish Ministry of Labour and Social Security (CSGB). Both events together provide a 360° panorama of the market and key impulses for the further implementation of uniform occupational safety standards as well as for establishing a prevention culture in companies in Turkey and its neighbouring states. A high-quality workplace within companies, which can be measured thanks to comparable standards, fewer occupational accidents and diseases in Turkey – these were the objectives the German-Turkish Occupational Safety Dialogue started in Düsseldorf in 2013. Back then Turkey was the partner country of the trade fair A+A with Congress, the biggest expert forum for safety, security and health at work. A partner country that boasts a high user potential for personal protective equipment with its over 20 million insured persons and one that has become an attractive market for PPE suppliers. The market trend and global rise in interest in occupational safety and occupational medicine was followed by the premiere of TOS+H EXPO organised in cooperation with the Turkish Ministry of Labour and Social Security (CSGB) in 2014. Since then the Turkish Occupational Health + Safety Exhibition has been organised by Messe Düsseldorf, supported by the local trade fair organiser Tezulaş Fuar. 2016 saw more than 100 exhibitors from 17 nations present their ranges to over 5,000 trade visitors at TOS+H EXPO. 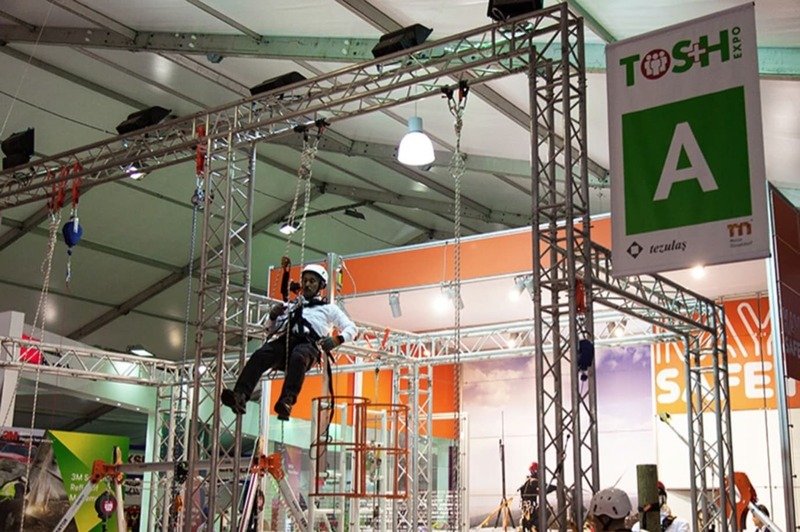 The Turkish Occupational Safety + Health Exhibition is part of Messe Düsseldorf’s portfolio for safety and health at work alongside A+A (world’s No. 1 Trade Fair for Safety, Security and Health at Work), in Düsseldorf, COS+H (China International Safety + Health Exhibition) in Beijing, INOS+H (Indian Occupational Safety + Health Exhibition) in New Delhi and OS+H Asia (Occupational Safety + Health Exhibition for Asia) in Singapore.